In just a few hours Brittany Gibson will play in one of the biggest games of her life. Tonight, the Brisbane Lions’ fate for the second AFLW season will be decided. If they win, they’re a chance of reaching a consecutive Grand Final. If they lose, their season is over. “Having three losses now, I definitely want to finish the season on a high and give ourselves the best opportunity to let it all settle at the end of this weekend and find out where we do sit,” Gibson told lions.com.au. 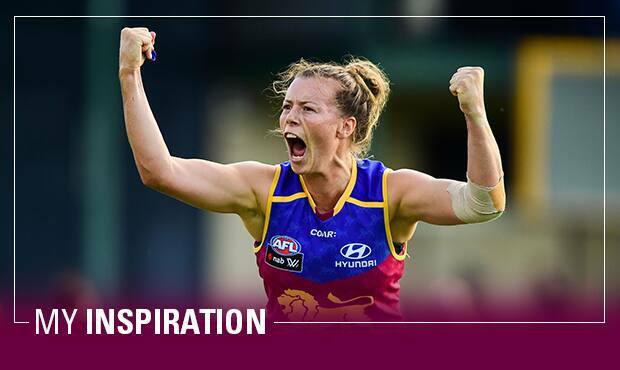 Before she runs out at the Blacktown International Sportspark this evening, Gibson will think of her mother Megan back home in Wilmot, a small town outside of Cradle Mountain in Tasmania. “I think about her and my Nan, my Pop, my Dad and family sitting at home. They’d be all huddled around the TV fighting about the volume and this one talking and that one talking,” she laughs. “Dozer”, nicknamed for her bulldozing tackles, would not be living her dream if it wasn’t for her Mum. “She always encouraged me to follow my dream as a footballer….Especially when you played with the boys as a child and didn’t really have this future and stuff. Britt Gibson photographed with her biggest inspirations, Mum and Dad. Megan is her biggest inspiration. “She is. I probably don’t tell her enough." This was only reinforced when Megan was diagnosed with multiple sclerosis four years ago, when she was 50 years old. “I knew it was serious because you hear things about MS but I really didn’t know the severity of it,” Gibson said. Megan, like her daughter, enjoyed physical work but soon after her diagnosis had to cut back. Her body had started to feel numb and tingled, her eyesight worsened, and her judgment and memory became blurry. She felt tired and unwell often. “My Mum is a very headstrong lady,” Gibson said. Gibson has to travel to Tasmania to see her Mum as the Queensland sun and heat does not mix well with MS. The only time she has ever travelled to Queensland in her life was to watch Gibson play in the inaugural AFLW grand final at Metricon Stadium last year. “She really enjoyed her time up here but she was ready to go home,” she said. Before her Mum’s diagnosis, Gibson admits she was unaware of what MS sufferers live with each day. That’s why in June she will cycle 100 kilometres for the 2018 Brissie to the Bay MS Bike ride to help raise awareness. “I love bike riding… but never actually tackled a long-distance bike ride though." “It’s going to hurt a little bit, so I better get training." Gibson is doing this for her Mum before she herself comes to learn first hand what it will be like to be a mother herself. She is expecting her first child with her partner Jamie later this year.